When City Council passed a resolution on Sept. 14 that committed Baytown to becoming a no-kill city by 2025, it marked a major turning point for homeless animals in our community. The unanimous vote by council members means that by 2025, the city plans to ensure that 90 percent or more of all healthy adoptable animals entering its animal control facility will be saved. Further, the city supports implementing programs and policies to become a no-kill facility by increasing live outcomes and decreasing euthanasia. “The passage of this resolution allows us to plant a stake in the ground, placing Baytown alongside some of the most progressive communities in the country that are working toward the same life-saving goals,” said Jay Garrett Jr., founder and executive director of A Life to Live. A Life to Live, a non-profit organization with a no-kill mission, initiated the push for a local no-kill resolution with full support from City Council member Robert Hoskins. While the goal for achieving no-kill is 2025, the work needed to reach that status is already underway. In the aftermath of Hurricane Harvey, A Life to Live volunteers worked with city staff and other partners to reach and maintain a live release rate that exceeded 90 percent. “Continuing this level of life-saving success requires a community-wide effort involving all pet lovers, through volunteering, fostering, adopting and donating,” Garrett said. Reuniting people with displaced pets at Baytown Animal Shelter and in the community. Providing pet food and supplies to help keep people and their pets together. Assisting with adoptions at the shelter and through large-scale adoption events. Recruiting new foster families to rescue pets from the shelter. Expanding our roster of rescue partners and transporting pets to reputable organizations within a 200-mile radius of Baytown. Working with veterinarian partners to provide low-cost and free services to shelter, rescued and owned pets. “This work must continue to grow so that we can reach more people and save more pets,” Garrett said. A Life to Live hopes to implement several nationally recognized life-saving programs in partnership with the City of Baytown. Included is our Good Felines program, which serves the community cat population by humanely and effectively limiting the reproduction of cats through trap-neuter-return and shelter-neuter-return. Another program is PASS (Positive Alternatives to Shelter Surrender), which has been proven to decrease shelter intake and increase live release outcomes. “These are no-kill programs that we are actively working toward, but they take time, people, funds and resources to implement,” Garrett said. A Life to Live also is reviewing city ordinances and comparing them to those within no-kill communities, like the City of Austin. 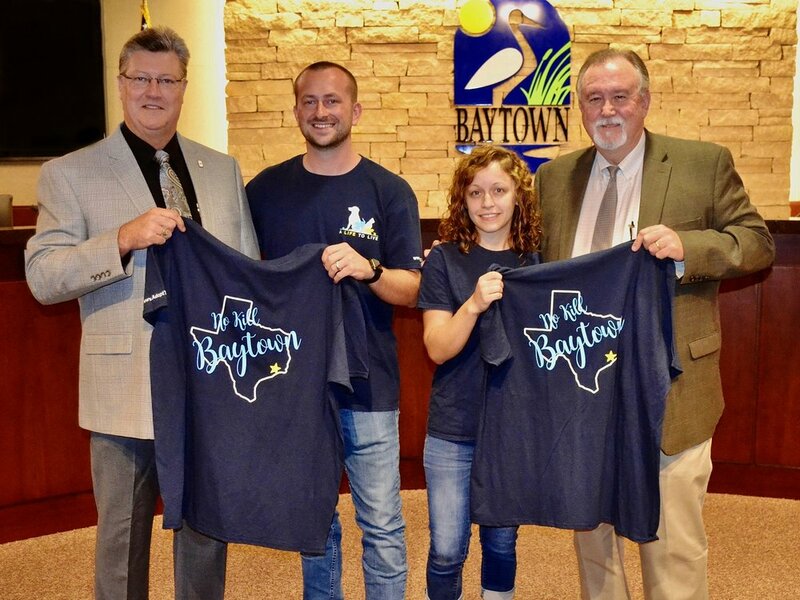 We recently presented No-Kill Baytown T-shirts to Baytown Mayor Stephen DonCarlos and City Council member Robert Hoskins. It recognizes their support for the council’s passage of a resolution that commits the city to becoming no-kill by 2025. Since that occurred, A Life to Live has been hard at work on next steps to achieve no-kill status.